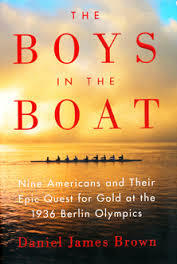 I just finished reading The Boys in the Boat, a fantastic underdog story about the University of Washington’s Crew Team and their quest to win Gold at Nazi Germany’s 1936 Berlin Olympic Games. Written from interviews, diary entries, and memories of the crew members, Daniel James Brown captured what it was like to beat the odds through trust and teamwork. While I read this powerful story of nine young men embarking on a personal and spiritual journey, it amazed me how often I was jolted by the similarities of what these young men faced and what most organizations face on their journey to reach best-in-class status on Employee Engagement. “Rowing is the toughest of sports,” said George Pocock, the man who built the crew team’s skulls. “Once the race starts, there are no time-outs, no substitutions. It calls upon the limits of human endurance. The coach must therefore impart the secrets of the special kind of endurance that comes from mind, heart, and body.” Just like rowing, reaching the finish line of employee engagement and winning gold is not easy. It’s truly an endurance sport. Your call to action: Make sure you have the right coach/manager to inspire your employees’ minds, hearts, and bodies so that they are able to endure the pain and win. As Americans, we love a “come from behind” story. The majority of this book takes place during one of the darkest chapters in American history, beginning in 1933 and through the Great Depression. This remarkable crew team had a wildly different upbringing than their heralded counterparts on the east coast at Harvard, Yale, and Princeton. They were the sons of loggers, dairy farmers, and ship and mine workers. Not from families of privilege, they had no idea how they were going to manage earning one year’s university tuition to the next, but they did. They knew how hard they would need to work to come out ahead, but they were deeply motivated, largely because of their coach. He regularly reminded his team of how meaningful their journey was, and how they could achieve anything through determination. Your call to action: Focus on meaning and purpose as key ways of engaging your team. Make sure they know how they are contributing to the success of the organization as a whole. All of the most engaged companies with whom I worked during my twenty-six year consulting career were as deliberate in their strokes as The Boys in the Boat. They realized that the journey to the finish line would not be easy and that their goal was to get better and better in anticipation of the next finish line. They were fervent believers in continuous improvement. None expected to achieve excellence overnight. When faced with myriad obstacles along the way, they hunkered down and either rowed through it or used their engagement to create new workarounds. Your call to action: Keep moving! In hard times, momentum is a manager’s best friend. Cultures of great employee engagement are ones in which team members trust one another and aim for the best teamwork possible. There were two unforgettable passages about teamwork and trust. One is where the crew member Shorty Hunt, who sat directly behind the book’s main character Joe Rantz in the skull, says “I got your back, Joe.” That kind of reassurance, especially from peers, is extremely strong, and adds core strength to the team, as it did for Joe Rantz in nearly every race. The second was where Joe Rantz realized that he would never achieve his full potential unless he trusted the other men in the skull. It was only after Joe proffered his full trust to all of them that he realized his full potential as the anchor of strength in the skull. Your call to action: Support employee comradery and teamwork. An “every man for himself” culture won’t enable your organization to perform better than the competition. “By and large, every rower in an eight-oared shell does the same thing – pull the oar through the water as smoothly as possible, as hard and as frequently as requested by the coxswain. But there are subtle differences in what is expected of individual rowers dependent upon which seat they occupy . . . . When working well, the entire boat operates like a well-lubricated machine, with every rower serving as a vital link in a chain that powers that machine forward.” The same can be said for a well-run company with highly engaged employees. In fact, when I first read the passage above I thought back to one of Jim Collins seminal messages in his Best-seller Good to Great, with each seat on the bus identical to each seat in the skull. To win gold in crew, you need to have the right person in the right seat of the skull. Your call to action: Hire the right people for the right seat, move the people who are in the wrong seat, and remove anyone who is rowing in the wrong direction. When I began reading The Boys in the Boat, I thought I was reading a story about a crew team. By the end, I realized the book is about something much more personal and meaningful. Hard work, engaged behaviors, mutual respect, trust, teamwork, perseverance, and consistency of rhythm not only work well in a skull, but work equally as well in a workplace. Kevin Sheridan has spent thirty years as a high-level Human Capital Management consultant. He has helped some of the world’s largest corporations break down detrimental processes and rebuild a culture that fosters productive engagement, earning him several distinctive awards and honors in the process. Kevin’s premier creation, PEER®, is consistently recognized as a long overdue, industry-changing innovation in the field of Employee Engagement, and his most recent book, “Building a Magnetic Culture,” made the New York Times, Wall Street Journal, and USA Today best-seller lists. Kevin can be reached via email at kevin@kevinsheridanllc.com, on LinkedIn at http://www.linkedin.com/in/kevinsheridan1 and on twitter @kevinsheridan12. His webpage is www.kevinsheridanllc.com.